This two-day annual programme from The At Work Partnership provides an in-depth clinical and management update on some of the cutting-edge issues in occupational health today. We have gathered together a group of leading experts in their fields to bring you an unparalleled seminar, with practical information on some of the most important topics affecting your work. Colt Foundation Keynote 1: Good work? Did we create a ‘healthier tomorrow’? What was achieved and what more needs to be done? Can employers step up where government has failed? Fair dismissals – how long can the employer wait? What matters to you in OH practice? Ill or angry – are they sick or just fed up? What is ‘wellbeing’, and can we measure it? Ethical dilemma: when work makes you ill – are you still fit for work? Should OH report a worker unfit if the work is making them ill – even if they want to carry on working? Should OH inform the employer of work-related ill health, even if the employee refuses consent? And is consent to report required following statutory health surveillance?A roundtable debate with Prof Diana Kloss. An opportunity to work through a challenging case and discuss how to reach the best outcome with the experts. This two-day annual programme from The At Work Partnership provides an in-depth clinical and management update on some of the cutting-edge issues in occupational health today. We have assembled a group of leading experts to bring you an unparalleled seminar, with practical information on some of the most important topics affecting your work. • An analysis of the GMC guidance on consent and its implications for OH, from Prof Diana Kloss, and an examination of what has been achieved, and what still needs to be done in workplace health, with Prof Dame Carol Black – in our two Colt Foundation keynote lectures. • Guidance on what works in wellbeing – what are the most worthwhile interventions? • Plenty of opportunities to network with speakers and fellow delegates – including at our conference dinner. 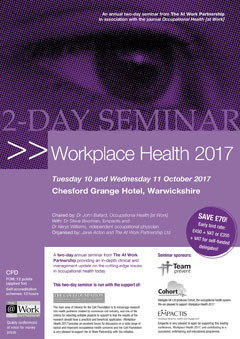 Don’t miss out – Workplace Health 2017 promises to be one of the most exciting OH events for 2017 – avoid disappointment by booking your place early! The main area of interest for the Colt Foundation is to encourage research into health problems created by commerce and industry, and one of the criteria for selecting suitable projects to support is that the results of the research should have a practical and beneficial application. Workplace Health 2017 provides an excellent forum for discussion on a wide range of topical and important occupational health concerns and the Colt Foundation is very pleased to support the At Work Partnership with this initiative. Empactis is very pleased to again be supporting this leading conference, Workplace Health 2017, and contributing to a successful, entertaining and educational programme. Medgate UK Ltd produce Cohort, the Occupational Health system. We reduce costs and increase efficiency by automating common admin tasks; meaning the department has more time to focus on providing a quality service.